Hoist Capital Corp. (the “Corporation”) (TSXV: HTE), a capital pool company under Policy 2.4 (the “CPC Policy”) of the TSX Venture Exchange (“Exchange”), is pleased to announce that it has entered into a non-binding Letter of Intent dated September 26, 2018 with The Sky Guys Ltd. (“Sky”) for the purposes of completing a Qualifying Transaction (“QT”) as defined in the CPC Policy. The proposed QT is an arm’s length transaction, as to the knowledge of the Corporation, no insider, promoter or control person of the Corporation has any material equity ownership or interest in Sky prior to giving effect to the QT. The proposed QT will be completed by way of an amalgamation, share sale, asset sale or similar transaction whereby the Corporation and Sky will complete a business combination and shareholders of Sky immediately prior to the QT will acquire a controlling interest in the resulting issuer (the “Resulting Issuer”). The final structure of the QT is subject to the receipt of tax, corporate and securities law advice for both the Corporation and Sky. Upon completion of the QT, the Resulting Issuer will carry on the business of Sky. Sky is a private company under the laws of the Province of Ontario and based in Oakville, Ontario that is focused on the delivery of unmanned aerial vehicle services in Canada across of a variety of industries, including oil & gas, utilities, wind turbines, infrastructure, constructions, mining and land development. Sky is in the commercialization stage of its business. Sky currently has 35,503,668 common shares (the “Sky Shares”) outstanding, 970,000 share purchase warrants exercisable into Sky Shares at $0.45 per share and 3,066,043 incentive stock options entitling the holders thereof to acquire Sky Shares at an exercise price of $0.30 per share. Sky is currently undertaking a private placement to secure up to $3 million from the issuance of promissory notes (the “Notes”) which provide for interest at a rate of 10% per annum. The terms of the Note provide that in the event that Sky completes an equity financing for gross proceeds of a minimum of $8,000,000 in connection with a public listing transaction, all principal and accrued interest under the Notes will automatically be converted into Sky Shares at a conversion price that is a 20% or 25% discount to the price at which the Sky Shares are issued in such financing, with the amount of the discount depending on when the public listing transaction is completed. The QT is currently expected to proceed by way of a business combination transaction pursuant to which Sky will become a wholly-owned subsidiary of the Corporation. In consideration of the Corporation’s acquisition of Sky, each Sky Share that is issued and outstanding immediately prior to completion of the QT will be exchanged for 5.333 common shares of the Corporation (the “Corporation Shares”) based on an agreed valuation of the Sky Shares of $0.80 per share. The Corporation may seek to complete a consolidation of the Corporation Shares prior to completion of the QT, in which case the number of Corporation Shares to be issued in exchange for each Sky Share will be adjusted accordingly. In conjunction with the QT, Sky intends to complete a brokered brokered private placement to secure a minimum of $8,000,000 gross proceeds from an equity financing (the “Financing”). The net proceeds of the financing will be used to fund commercialization of Sky’s business and for general and administrative expenses. completion of the Financing for gross proceeds of a minimum of $8,000,000. Adam Sax – President, Chief Executive Officer and Director – President & CEO of Sky, Mr. Sax is an entrepreneur, technological visionary, investor and speaker. With deep roots in technology, Mr. Sax started his first company at the age of 13 and has since founded and grown a number of successful companies ranging from Internet businesses to real estate brokerages to global development firms. He has been featured on Dragons’ Den, BNN, 24 Hours, Globe & Mail, Newstalk 1010, BetaKit, Toronto Star, BlogTO and BuzzBuzzHome, and is an ongoing contributor to Urban Toronto and Metro News. A technological visionary, Mr. Sax has a proven ability to create and market, which has been refined over years of experience in sales, strategy, and business innovation across a wide range of industries. He now endeavors to make the revolutionary benefits of drone technology accessible and applicable to businesses around the globe. Tom Hanson – Chief Operating Officer – As Chief Operating Officer of Sky, Mr. Hanson has led a growth strategy serving 600+ clients across Canada and 30 U.S. States.. He has a Bachelor of Science degree from the University of Guelph and over 10 years’ experience in management, business development and high-growth service operations, having worked with national firms specializing in digital asset management, IT solutions and technology. Prior to Sky, his management experience includes being Projects Lead for the Wadetech Group of Companies (digital asset management for the AEC industry), now part of Astley Gilbert Ltd. Mr. Hanson has been featured on Dragons’ Den, CBC, BNN, 24 Hours, Globe & Mail, CP24, Newstalk 1010, BetaKit, Toronto Sun, Urban Toronto, Metro News and various industry journals. 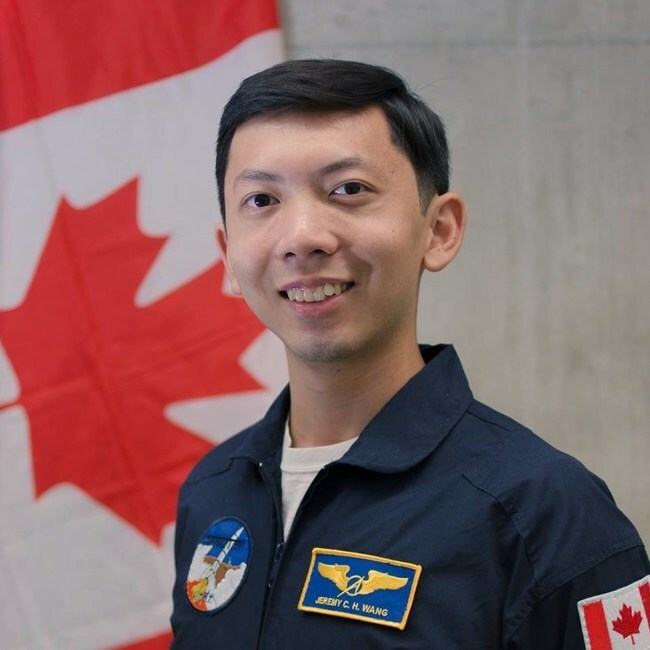 Jeremy Wang – Chief Technology Officer – Mr. Wang is Chief Technology Officer of Sky and holds a BASc in Engineering Science from the University of Toronto. He is an experienced leader of aerospace R&D organizations and, along with additional experience in academic research and program facilitation in engineering leadership education, brings a wealth of engineering, business, and leadership skills to the expanding innovation portfolio at Sky. 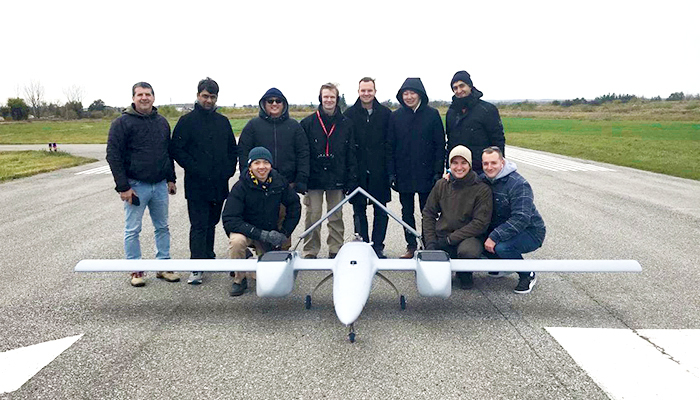 Prior Sky, Mr. Wang’s work involved engineering design, program management, executive leadership, and fundraising over $36M for drone, rocket, and satellite development at the University of Toronto. He has also worked in space policy, defence CD&E, and rocket propulsion at the Space Generation Advisory Council, Canadian Forces Aerospace Warfare Centre, and the German space agency (DLR). In 2016, Mr. Wang was inducted as one of Canada’s Next 36 highest potential young entrepreneurs, and in 2018, he was inducted as a laureate of AIAA’s Tomorrow’s Aerospace Engineering Leaders. JD Dolan – Director – Mr. Dolan is co-founder and principal at LDR Investment Group (LDR), where he has led the initiative to introduce U.S. Special Operations Forces methodology in innovative leadership, elite team-building and investment acceleration to both domestic and international organizations from startups to multi-billion-dollar enterprises. He successfully sourced and led LDR’s acquisition by one of the world’s most well-respected value investing firms, Fairfax Financial Holdings Limited. Mr. Dolan is a former U.S. Ranger Strike Force Commander and Light Infantry Officer and was deployed four times in support of combat operations in Iraq and Afghanistan, as a Ground Force Commander with 1st Battalion, 75th Ranger Regiment- US Special Operations Command (SOCOM). Ian M. Hull – Director – Mr. Hull is Co-Founding Partner, Hull & Hull LLP, a Toronto based law firm focused on estate, trust and capacity litigation, mediation and estate planning. Mr. Hull is a Certified Specialist (Estates and Trusts Law) Certified Specialist (Civil Litigation) and was admitted to the Ontario Bar in 1990. He has authored numerous legal texts and articles relating to trusts and estates and is a member of Canadian Bar Association, The Advocates’ Society and the Editorial Advisory Board of the Canadian Estate Administration Guide and a former member of the Executive of the Trusts and Estates Section of the Ontario Bar Association, Metropolitan Toronto Lawyers Association, Halton County Law Association, Society of Trusts and Estates Practitioners (STEP) and fellow of the American College of Trust and Estate Counsel (ACTEC). Stuart W. Henderson – Director – Mr. Henderson is a lawyer based Oakville, Ontario specializing in wills and estates, real estate, matrimonial and corporate commercial law. He obtained his Honours History Degree from the University of Western Ontario and Law Degree from Queen’s University along with his Mediation Certificate from the Harvard Negotiation Institute at Harvard Law School. His professional recognition includes being the past Chair of the Town of Oakville`s Heritage Oakville and Heritage Review Committees and past Vice-Chair and Chair of the Conservation Review Board of Ontario. He is also a presiding Deputy Judge of the Ontario Small Claims Court, Provincial Division. Don Reid – Director – Mr. Reid has enjoyed a distinguished business career of over 40 years as an executive and a corporate director. As an executive, Mr. Reid was recently Senior Vice President of George Weston and President and CEO of President’s Choice Financial until his retirement in 2006. Before that, Mr. Reid has held a variety of senior financial and leadership positions with the Weston/Loblaw group, including serving as Chief Financial Officer of both Loblaw and Weston. He also served as a director of a number of public companies, including Dollarama Inc. (TSX:DOL) and easyhome Ltd. (now goeasy Ltd.) (TSX:GSY). Trading in the Corporation Shares has been has been halted and the shares are not expected to resume trading until the QT has been completed, or until the Exchange receives the requisite documentation to resume trading. If the QT is completed, the Corporation expects to be listed on the Exchange as a technology issuer. The Corporation intends to make an application for exemption from the sponsorship requirements of the Exchange in connection with the QT, however there is no assurance that the Exchange will exempt the Corporation from all or part of applicable sponsorship requirements. The Corporation will issue a subsequent press release in accordance with the policies of the Exchange providing further details in respect of the Qualifying Transaction, including information relating the transaction structure, the Notes financing and the Financing and summary financial information of Sky. Statements in this press release regarding Sky’s business which are not historical facts, are “forward-looking statements” that involve risks and uncertainties, such as terms and completion of the proposed transaction. Since forward-looking statements address future events and conditions, by their very nature, they involve inherent risks and uncertainties. Actual results in each case could differ materially from those currently anticipated in such statements.